An attempt to reintroduce Pink & Blue Swirls was made around 1994 but then rejected. An unknown number of trial pieces were produced at that time identifiable by the square, black text on gold label. Globe vase, 9 cm high. Note the many bubbles, which were deliberately introduced into the glass. This attenuated bottle is the smaller of the two sizes at 39 cm tall. The larger bottle is 46 cm tall. Pink & Blue Swirls attenuated bottles are scarcer than Tortoiseshell bottles. 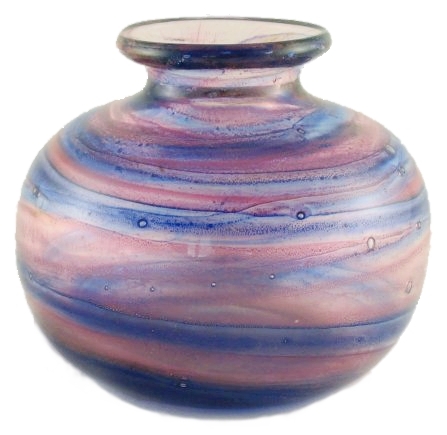 A trial cylinder vase attempting to re-introduce Pink & Blue Swirls about 1994. It is 22 cm high x 4.7 cm wide. This is the only example known.